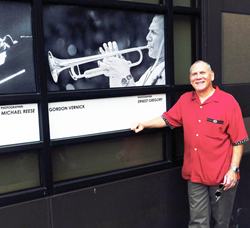 The portrait of Dr. Gordon Vernick, professor of music and coordinator of jazz studies at Georgia State University, is among 23 images of musicians on display in downtown Atlanta to mark the 40th anniversary of the Atlanta Jazz Festival. In honor of the festival’s anniversary, the Mayor’s Office of Cultural Affairs has installed a collection of photographs of jazz musicians in storefront windows throughout south downtown Atlanta. The project features images of musicians who have entertained festival audiences over the past 39 years. Vernick’s portrait at the corner of Peachtree Street and Martin Luther King Drive is aside other jazz greats in storefront windows. A professional trumpet player, Vernick has performed in all musical media, from symphony orchestra to jazz quartet. He is director of the university’s Faculty Jazztet, which performs regu­larly in Atlanta and has appeared at the Atlanta Jazz Festival, the High Museum Jazz Series, the International Association for Jazz Education Conference and many other venues. Vernick has shared the stage with such world-renowned jazz artists as Kenny Werner, Clare Fischer, John Hart, Kevin Hays, Conrad Herwig, Marc Copland, Randy Brecker and Paul McCandless. Five photographers captured the images of Alexandria Jackson, Trombone Shorty and Ahmad Jamal taken by Ernest Gregory; Betty Carter, Joe Williams, Syl Alston and Johnny Griffin taken by Jim Alexander; Esperanza Spalding, Christian Scott and Stanley Clarke taken by Julie Yarbrough; Nnenna Freelon, Nina Simone, Curtis Lundy and Stanley Jordan taken by Michael Reese; and Ray Charles, Sarah Vaughan, Wynton Marsalis, and Dizzy Gillespie taken by Sue Ross. The coffee table book, Atlanta Jazz Festival Forty Years, commemorates the festival’s 40th anniversary and includes images from the installation among others.